The park provides an excellent resource for environmental studies, wildlife observing, fishing, and other recreational activities made possible by easy access to the Potomac River. Fourteen buildings and two structures are located in the historic district and associated with the property's sequential development as a plantation, an institutional agricultural complex, and a farm museum. The diverse history of Maryland and our national heritage can be experienced at Oxon Cove Park. Through hands on activities, living history programs, and more, you can experience farm life and how its changed over time. Explore how the park evolved from a plantation home during the War of 1812, to a hospital farm, to the park you can visit today. 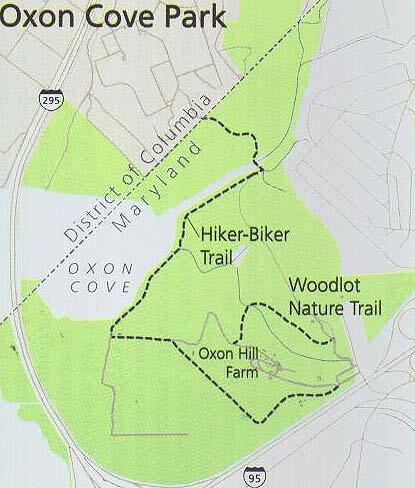 Oxon Cove Park, including Oxon Hill Farm, the Hiker/Biker Trail, and the Woodlot Trail are open daily from 8:00 AM to 4:30 PM; the park, farm, and trails are closed January 1, Thanksgiving Day, and December 25. Oxon Cove Park does not have an admission fee. All programs are free and open to the public unless otherwise indicated. Schedule of Activities: Group reservations are required for our most popular programs such as, Meet the Dairy Cow, Chicken and Egg, and Wagon Rides. Groups of 5 or more can schedule reservations at least 2 weeks prior to the visit by calling Stephanie Marrone on 301-839-1176. 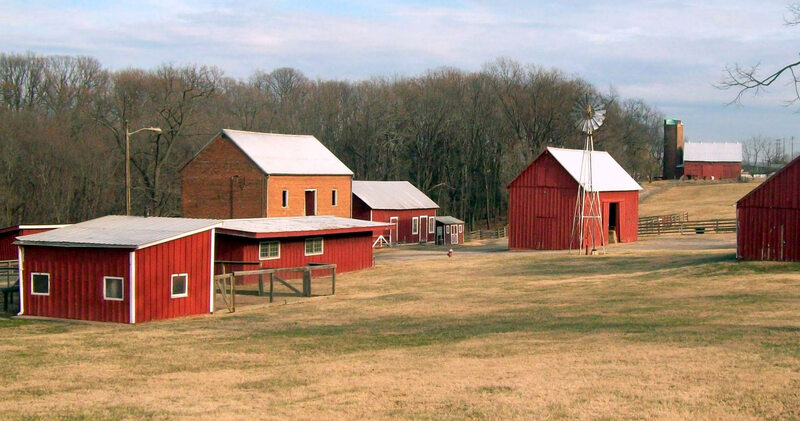 Self-guiding Tour: You can explore on your own and see farm equipment, historic structures, our Visitor Center, and barnyard (the animals may not always be in view and may be in different locations). Hiking and Biking: Venture beyond the hilltop and explore part of Oxon Cove Park's 512 acres by strolling along the lower fields or riding the bike path along Oxon Cove. Picnicking: Enjoy a picnic at one of our designated picnic areas. No reservations needed. Food is not sold in the park. Events and Educational Activities: The park offers a wide variety of seasonal programs, demonstrations, special events, and curriculum-based education programs. The Visitor Barn Bookstore is opened daily from 9 a.m. to 3:45 p.m. The Mount Welby historic house is accessible to visitors with wheelchairs. If you or someone in your group is in a wheelchair or has other mobility or special needs, please call the park before your visit at 301-839-0503 so that we can make sure to accommodate these needs as best as possible. For hundreds of years, the land that is today Oxon Cove Park, has attracted men and women who have recognized its agricultural potential. Beginning in the early 19th century, Oxon Cove Park witnessed changing land patterns typical of the southern Maryland region. These changes began with the Debutts family who bought the property and established the Mount Welby Plantation. The Mount Welby period represents only one layer of the park's deep and diverse history. The park has been home for many generations of human habitation during the past 10,000 years--beginning with the Native American peoples who have hunted for wild game and gathered plants up until the 17th century. Forty-eight years after the Debutts sold the property; the land was acquired by the United States Government to establish a therapeutic farm for St. Elizabeths Hospital known as Godding Croft. The property was entrusted to the National Park Service in 1959 to protect its natural and cultural resources from the threat of increased urban development, and to continue to tell the story of the land and how it has changed overtime.